Dr. Shreya Dubey brings with her over 7 years of experience having previously worked with Apollo Cradle Hospital, Delhi. 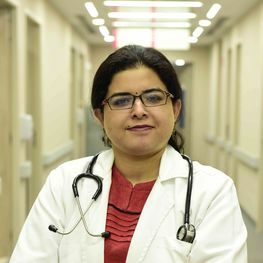 She completed her post-graduation from King George Medical University and holds a DNB Pediatrics from Jaipur Golden Hospital both with gold medals along with a Fellowship in Neonatology from National Neonatology Forum. She previously worked with Apollo Cradle Hospital, Delhi. She is a high-risk newborn specialist with expertise in premature and ELBW babies’ care, neonatal intensive care, behavioural paediatrics, infant nutrition and child and adolescent health.